At Berghain Kantine, the crowd was subdued. The twilit room with chairs set up for listeners and the undivided attention of the crowd made for an exclusive vibe, but one excellent for listening. 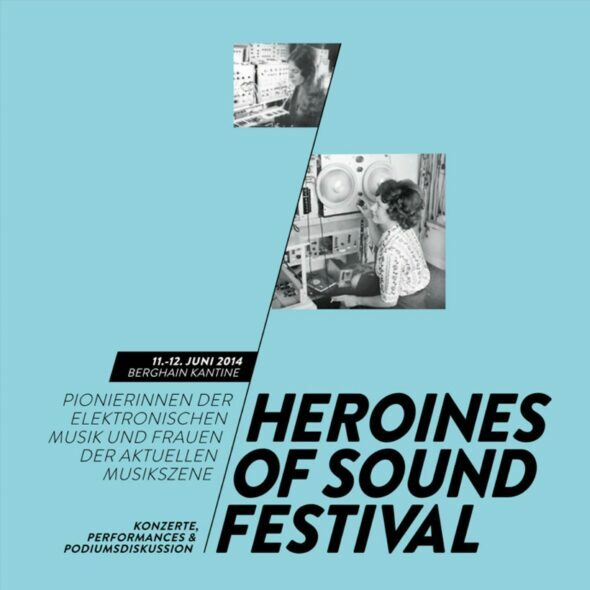 The two-day Heroines of Sound Festival included a cerebral mix of panel discussions, reflection, and live performances all surrounding the theme of women pioneers of electronic sound art. The programming on Day One began reflecting on Laurie Spiegel‘s work in the 1970s using algorithms for her compositions and ended with a premiere piece of the ensemble Les Femmes Savantes. The curation of each act of the program built upon the broad theme of experimental sound art, featuring a range from the traditional lone artist with laptop glow illuminating her face, to head-banging textured electric guitar loops. Heidrun Schramm’s performance of Direktverbindung manipulated live radio sounds, fragmenting the broadcasts into a knocking, jagged tempo. The musical ad-hoc composition was the first live performance of the night, and the most intimate. Catherine Lorent followed, layering her rich moans over the harsh yet sophisticated tones and feedback produced by her use of a hand-held e-bow. After a short intermission, Les Femmes Savantes took stage. Spider Silk was the name of their half-hour composition that began with vocal performers Ute Wassermann and Sabine Ercklentz in chairs on the left conversing with their sounds. The duo held microphones to their throats as they swallowed sips of water, burping and contracting their throats on the way. The rest of the onstage noise laboratory action included a trumpeter and a performer blowing air through long tubes into a beaker, causing it to bubble as if it were boiling.With spot-on facial expressions and reactions, their showmanship became comedic, drawing roots from their namesake, Molière’s satire of “learned” societal women. The mix of artists during the entire Day One program from Argentina, Germany, Sweden, the US, hailing from various academic and artistic backgrounds, made for a night that encouraged the curiosity of pure sound. Avant-garde sound art and music thrives in Berlin, but the festival demonstrated the key female founders of this genre, and how women continue to participate in expanding the art today. Blog entry by AJ Kiyoizumi in Berlin; Saturday, Jun. 14, 2014.